Photo from the book With the Judaeans in the Palestine Campaign. Lieutenant-Colonel John Henry Patterson, DSO (10 November 1867 – 18 June 1947), known as J. H. Patterson, was a British soldier, hunter, author and Christian Zionist, best known for his book The Man-Eaters of Tsavo (1907), which details his experiences while building a railway bridge over the Tsavo river in British East Africa (now Kenya) in 1898–99. The book has inspired three Hollywood films – Bwana Devil (1952), Killers of Kilimanjaro (1959) and The Ghost and the Darkness (1996) in which he was portrayed by Val Kilmer. Patterson was born in 1867 in Forgney, Ballymahon, County Longford, Ireland, to a Protestant father and Roman Catholic mother. He joined the British Army at the age of seventeen and eventually attained the rank of Lieutenant-Colonel and was awarded the Distinguished Service Order (DSO). He finally retired from the military in 1920. In 1898, Patterson was commissioned by the Uganda Railway committee in London to oversee the construction of a railway bridge over the Tsavo River in present-day Kenya. He arrived at the site in March of that year. Almost immediately after Patterson's arrival, lion attacks began to take place on the workforce, with the lions dragging men out of their tents at night and feeding on their victims. Despite the building of thorn barriers (bomas) around the camps, bonfires at night, and strict after-dark curfews, the attacks escalated dramatically, to the point where the bridge construction eventually ceased due to a fearful, mass departure by the workers. Along with the obvious financial consequences of the work stoppage, Patterson faced the challenge of maintaining his authority and even his personal safety at this remote site against the increasingly hostile and superstitious workers, many of whom were convinced that the lions were in fact evil spirits, come to punish those who worked at Tsavo, and that he was the cause of the misfortune because the attacks had coincided with his arrival. The man-eating behaviour was considered highly unusual for lions and was eventually confirmed to be the work of a pair of rogue males, who were believed to be responsible for as many as 140 deaths. Railway records officially attribute only 28 worker deaths to the lions, but the predators were also reported to have killed a significant number of local people of which no official record was ever kept, which attributed to the railway's smaller record. Various theories have been put forward to account for the lions' man-eating behaviour: poor burial practices, low populations of food source animals due to disease, etc. There was a slave trade route through the area, which contributed to a considerable number of abandoned bodies. Patterson reported seeing considerable instances of unburied human remains and open graves in the area, and it is believed that the lions (which, like most predators, will readily scavenge for food) adapted to this abundant, accessible food supply and eventually turned to humans as their primary food source. One of the lion's skulls was found to have a badly abscessed canine tooth that could have hindered normal hunting behaviour. However, this hypothesis accounts for the behaviour of only one of the lions involved, and Patterson himself personally disclaimed it, saying he had damaged the tooth. With his reputation, livelihood, and safety at stake, Patterson, an experienced tiger hunter from his military service in India, undertook an extensive effort to deal with the crisis. 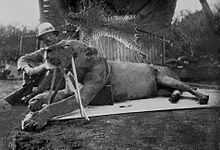 After months of attempts and near misses, he finally killed the first lion on the night of 9 December 1898 and the second one on the morning of 29 December (narrowly escaping death when the wounded animal charged him). The lions were maneless like many others in the Tsavo area, and both were exceptionally large. Each lion was over nine feet long from nose to tip of tail and required at least eight men to carry it back to the camp. The workers and local people immediately declared Patterson a hero, and word of the event quickly spread far and wide, as evidenced by the subsequent telegrams of congratulations he received. Word of the incident was even mentioned in the House of Lords, by the Prime Minister Lord Salisbury. Baboo PURSHOTAM HURJEE PURMAR, Overseer and Clerk of Works, on behalf of your Workmen. Dated at Tsavo, January 30, 1899." Patterson considered the bowl to be his most highly prized and hardest won trophy. 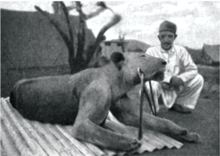 In 1907, he published his first book, The Man-eaters of Tsavo, which documented his adventures during his time there. It was the basis for three films; Bwana Devil (1953), Killers of Kilimanjaro (1959) and the 1996 Paramount Pictures film, The Ghost and the Darkness, starring Val Kilmer (as Patterson) and Michael Douglas (as the fictional character "Remington"). In 1924, after speaking at the Field Museum of Natural History in Chicago, Illinois, Patterson agreed to sell the Tsavo lion skins and skulls to the museum for the then sizeable sum of $5,000. The lion skins were then stuffed and are now on permanent display along with the original skulls. The reconstructed lions are actually smaller than their original size, due to their skins' having been originally trimmed for use as trophy rugs in Patterson's house. In 1906, Patterson returned to the Tsavo area for a hunting trip. During the trip, he shot an eland, which he noted possessed different features from elands in Southern Africa, where the species was first recognized. On returning to England, Patterson had the head of the eland mounted, where it was seen by Richard Lydekker, a member of the faculty of the British Museum. Lydekker identified Patterson's trophy as a new subspecies of eland, which Lydekker named Taurotragus oryx pattersonianius. Colonial Secretary Lord Elgin appointed Colonel Patterson to the post of Game Warden — that is, superintendent of game reserves in the East Africa Protectorate, an experience he recounts in his second book, In the Grip of Nyika (1909). While on a safari with Audley Blyth, a son of James Blyth, 1st Baron Blyth, and Blyth's wife Ethel, Patterson's reputation was tarnished by Blyth's death by a gunshot wound (possible suicide – exact circumstances unknown). Witnesses confirmed that Patterson was not in Blyth's tent when the shooting took place, and that it was in fact Blyth's wife who was with him at the time, as she was reported as having run screaming from the tent immediately following the shooting. Patterson had Blyth buried in the wilderness and then insisted on continuing the expedition instead of returning to the nearest post to report the incident. Shortly after, in poor health, Patterson returned to England with Mrs Blyth amid rumours of murder and an affair. Although he was never officially charged or censured, this incident followed him for years after in British society and in the army. His case was raised in Parliament in April 1909. The incident was referenced in the film The Macomber Affair (1947), which was based on Ernest Hemingway's The Short Happy Life of Francis Macomber (1936). Patterson joined the Essex Imperial Yeomanry for the Second Boer War (1899–1902), and served with the 20th Battalion, Imperial Yeomanry, for which he was awarded the Distinguished Service Order in November 1900. He returned home, but was again called for service when on 17 January 1902 he was appointed to command the 33rd Battalion, Imperial Yeomanry, with the temporary rank of lieutenant-colonel. The battalion left Southampton on SS Assaye in May 1902, arriving in South Africa after the war had ended with the Peace of Vereeniging. Colonel Patterson commanded the West Belfast regiment of the Ulster Volunteers during the Home Rule Crisis of 1913–14. He served in the First World War. Although he was himself a Protestant, he became a major figure in Zionism as the commander of both the Zion Mule Corps and later the 38th Battalion of the Royal Fusiliers (also known as the Jewish Legion) which would eventually serve as the foundation of the Israeli Defence Force decades later. The Zion Mule Corps, which served with distinction in the Gallipoli Campaign has been described as "the first Jewish fighting force in nearly two millennia". During his time in command of the Jewish Legion (which served with distinction in the Palestine Campaign), Patterson was forced to deal with extensive, ongoing anti-semitism toward his men from many of his superiors (as well as peers and subordinates), and more than once threatened to resign his commission to bring the inappropriate treatment of his men under scrutiny. He retired from the British Army in 1920 as a lieutenant-colonel (the same rank he held when the war started) after thirty-five years of service. It is generally accepted that much of the admiration and respect of his men (and modern-day supporters) is due to the fact that he essentially sacrificed any opportunity for promotion (and his military career in general) in his efforts to ensure his men were treated fairly. His last two books, With the Zionists at Gallipoli (1916) and With the Judaeans in the Palestine Campaign (1922) are based on his experiences during these times. After his military career, Patterson continued his support of Zionism. He remained a strong advocate of justice for the Jewish people as an active member of the Bergson Group and a promoter of a Jewish army to fight the Nazis and to stop the Holocaust. He was a member of the Emergency Committee to Save the Jewish People of Europe. During the Second World War, while he was in America, the British government cut off his pension, arguing they had no way to securely transmit his funds to him. This left Patterson in severe financial difficulty. Just the same, he energetically continued working toward the establishment of a separate Jewish state in the Middle East, which became a reality with the statehood of Israel on 14 May 1948, less than a year after his death. Patterson was close friends with many Zionist supporters and leaders, among them Ze'ev Jabotinsky and Benzion Netanyahu. According to Benzion's younger son Benjamin Netanyahu, who later became Prime Minister of Israel, Benzion named his first son, Yonatan Netanyahu, after Patterson. Patterson attended Yonatan Netanyahu's circumcision and gave him a silver cup engraved with the words "To my beloved godson Yonatan from Lt.-Col. John Henry Patterson". He married Frances Helena Gray in 1895. She, in 1890, had been one of the first women to take a law degree in the UK. Their son Bryan Patterson (1909–79) became a palaeontologist at the Field Museum in Chicago. During the 1940s, Patterson and his wife, "Francie", lived in a modest home in La Jolla, California. Eventually, with his wife in need of regular medical care and his own health in decline, he took up residence at the home of his friend Marion Travis in Bel Air, where he eventually died in his sleep at seventy-nine years of age. His wife died six weeks later in a San Diego nursing home. Both Patterson and his wife were cremated, and their ashes were interred at Angelus-Rosedale Cemetery, niche 952-OC in Los Angeles. According to Patterson's grandson, Alan Patterson, one of his final wishes was that both he and his wife eventually be interred in Israel, ideally with or close to the men he commanded during the First World War. Alan Patterson, the Jewish American Society for Historic Preservation, Canadian representative Todd Young, Beit HaGedudim (the museum of the Jewish Legion), and the moshav (village) of Avihayil (represented by Ezekiel Sivak) began a coordinated effort to honour this request in 2010. With the assistance and support of the Israeli government and Prime Minister Benjamin Netanyahu, on 4 December 2014, the remains of Patterson and his wife, were re-interred in the Avihayil cemetery where some of the men he commanded are buried. Attending the ceremony were Prime Minister Netanyahu, members of his family, military and cabinet members of the Israeli government, the British Ambassador, the Irish Ambassador, Alan Patterson, Jerry Klinger of the Jewish American Society for Historic Preservation, Ezekiel Sivak of Avihayil, representatives and descendent family members of the Jewish Legion, Christians supporters of Israel, 350 guests and numerous other dignitaries. Netanyahu referred to Patterson as "the godfather of the Israeli army" and "a great friend of our people, a great champion of Zionism and a great believer in the Jewish State and the Jewish people....I feel it is an obligation of our people, our State and mine personally to fulfil his testimony". A souvenir plate postal stamp was issued by the Israel Philatelic Service in Patterson's honour. ^ "No. 29160". The London Gazette (Supplement). 11 May 1915. p. 4622. ^ Patterson, J.H. (1907) The Man-Eaters of Tsavo. Macmillan. In the introduction to the Peter Hathaway Capstick Libray edition (1986: St. Martin's Press), Capstick writes, "As for the Tsavo Bridge? Alas, the German forces blew it to atoms during the East African Campaign, wasting all the terror, death, and horror that surrounded its creation in the first place." ^ Baboo PURSHOTAM HURJEE PURMAR, Overseer and Clerk of Works, on behalf of your Workmen. Dated at Tsavo, January 30, 1899. ^ "No. 27359". The London Gazette. 27 September 1901. p. 6307. ^ "No. 27415". The London Gazette. 11 March 1902. p. 1732. ^ "No. 27432". The London Gazette. 9 May 1902. p. 3091. ^ "The War – the reinforcements". The Times (36768). London. 15 May 1902. p. 9. ^ A. T. Q. Stewart, The Ulster Crisis (1967), p. 122; Timothy Bowman, Carson's Army: The Ulster Volunteer Force, 1910–22 (2007), p. 60. Denis Brian's biography does not mention any involvement with the UVF, but is rather vague on this period of Patterson's life. ^ EMAIL, Jewish Magazine. "the Jewish Legion and the Israeli Army". Jewishmag.com. Retrieved 3 October 2011. ^ "The lion-killer who became an Israeli hero". BBC News. 29 November 2014. Retrieved 30 November 2014. ^ Olsen, Everett C. (1985). "Bryan Patterson 1909–1979 A Biographical Memoir" (PDF). National Academy of Sciences. Retrieved 21 May 2014. ^ "The Lion Hunter Returns to Zion". Retrieved 2016-09-23. ^ "Non-Jewish L.A. Zionist John Henry Patterson buried in Israel | Israel". Retrieved 2016-09-23. "John Henry Patterson photo". fieldmuseum.com. Streeter, Patrick (2004). Mad for Zion: A Biography of Colonel J.H. Patterson. Matching Press. ISBN 978-0-951-86643-6. "John Heny Patterson Biography – Zionism and Israel – Biographies". Zionism-israel.com. Retrieved 3 October 2011. This page was last edited on 1 January 2019, at 21:50 (UTC).